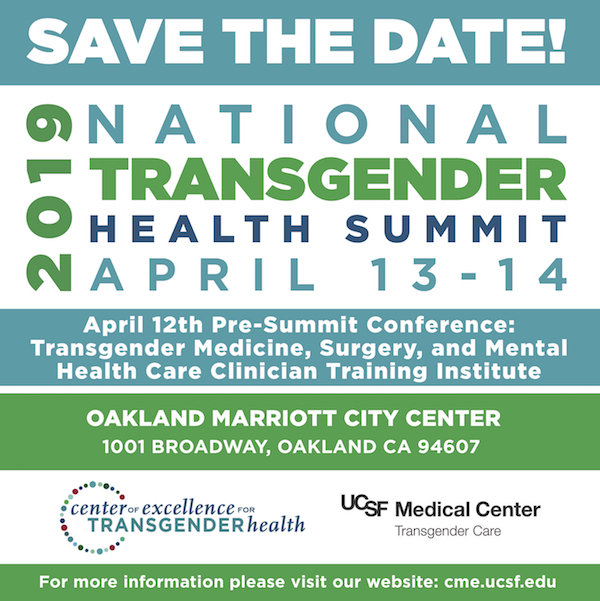 The Center of Excellence for Transgender Health (COE) at the University of California (UCSF) has announced plans for the 2019 National Transgender Health Summit (NTHS), the biannual national conference on transgender health. This program presents cutting-edge research, evidence-based education sessions, and training opportunities across many disciplines. 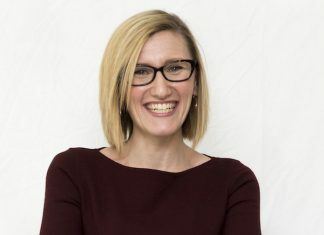 The summit is designed for community-based and non-profit organizations, trans-owned businesses and organizations, healthcare organizations and businesses, granters and funders, and university and college personnel. On April 12, 201, COE will present a Pre-Summit Conference by the Transgender Medicine, Surgery, and the Mental Health Care Clinician Training Institute. The Preconference will be offered as an add-on to the NTHS at a reduced rate. The Center of Excellence for Transgender Health combines the unique strengths and resources of the Pacific AIDS Education and Training Center (PAETC), a nationally renowned training institution, and an internationally recognized leader in HIV prevention research, the Center for AIDS Prevention Studies (CAPS), both of which are also housed at UCSF along with COE. The ultimate goal of COE is to improve the health and well-being of transgender individuals by creating and implementing programs that respond to community-identified needs. 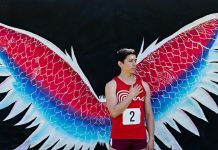 COE incorporates community perspectives through a national advisory body (NAB) of fourteen transgender leaders from around the country, including Oakland’s Cecilia Chung. The collective experience of COE’s diverse NAB ensures that that the programs address issues that are timely and relevant to the community. 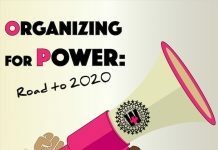 The 2019 NTHS aims specifically to increase healthcare and social services providers’ skills to optimize HIV prevention, treatment, and care for transgender patients, and to provide a professional forum for disseminating best practices, innovative techniques, and cutting-edge research to providers of transgender health and HIV prevention services. COE, CAPS, and the Alliance Health Project (AHP), another UCSF program, invite potential vendors and exhibitors to be a part of the 2019 National Transgender Health Summit (2019 NTHS). This biennial event attracts over 900 attendees including medical educators, physicians, behavioral health providers, researchers, allied health professionals, department health and government officials as well as members, leaders and advocates of the trans community. Vendor and exhibitor information can be obtained from Isabella Ventura at [email protected]. The 2019 NTHS will be held at the Oakland Marriott City Center, 1001 Broadway, Oakland, California 94607; Phone: 510-451-4000. The cut-off date for getting the Marriott’s special conference rate is March 22, 2019, or once the room block is filled. You can obtain more information about the conference by emailing [email protected]. For more information, log on to: http://transhealth.ucsf.edu/trans?page=home-00-00.